St. Louis Fed: "This Time, It's Different"
Jeremy Siegel's 3.5% Real Yields! A World of Currency Manipulators! "Over a period of four years, by virtue of the policies that we put in place, we'd get the unemployment rate down to 6%, and perhaps a little lower," Romney said. 1. 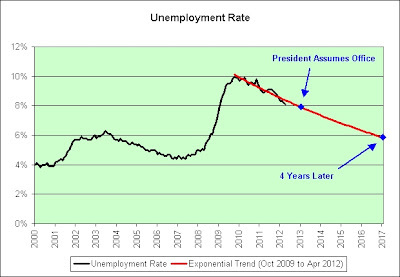 Romney understands exponential trend extrapolation. 2. 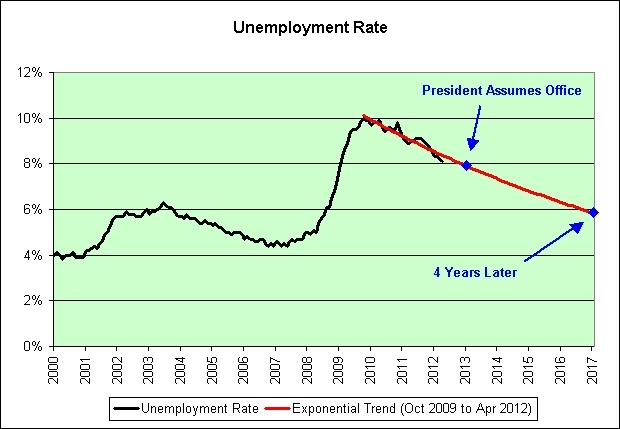 Romney understands exponential trend failure risks. "But we'd get the rate down quite substantially." 3. Romney understands how to twist the English language to appease the voters. What more could we want from a president? When normal people communicate, everything after the "but" is the truth. When politicians communicate, everything after the "but" is the lie. "I'll get the UE rate back down the the worst of the dotcom recession"
so we cured the dotcom malaise with $2.5T+/yr of debt take-on. At $50,000 per yob that should have been 50M yobs created. Where did that money goooo? You crack me up. I don't think either of us were meant to be politicians, lol. Well, that's the management mantra. Under-promise and over-deliver. If I may defend Romney, if we continue with more of the same, within four years that trend would break to the upside due to a Treasury debt crisis. Just avoiding that crisis and staying on trend is probably all we can reasonably ask. On the other hand, I don't think Obama will over-deliver either. There's only so much more hope and change that I can stomach. He should have focused on job creation from the moment he entered office. Yeah, it's unlikely Romney would be able to over-deliver. But just keeping us on your trend line would be quite a feat, I suspect. If one thinks of a recession as a failure and one also considers the mean time between failures, then we're already pushing our luck. Here is another way to look at that data.